Take a look through our FAQ list to find answers to commonly asked questions about camp at Island Lake and Miracle Ranch. What does an average day at Island Lake or Miracle Ranch look like? It looks like great food, tons of games and exciting activities for campers to expand their horizons. We rock out at Fireside each night while learning about a God who is wild about us. We also take care of some house cleaning along the way—we admire responsibility and character as much as an adventurous spirit! Our sample schedule below lets you in on the day-to-day adventures at Island Lake and Miracle Ranch. *This schedule is only a sample of a possible day at camp. **The schedule may vary depending upon age group and specific day of the week. Can my child be in a cabin with his/her friends? Friends are good. Cabin mate friends are even better! Be sure to request to share a cabin with your child’s friend on the supplemental form link received via email after registration is submitted (you can request up to two friends). Our accommodating staff will give campers the red carpet treatment when they arrive, escorting them to their home away from home. Check-In begins at 4:00 p.m. on Sunday (please arrive between 4:00 and 5:00 p.m. Sunday afternoon). Check-Out is at 5:00 p.m. on Wednesday. Check-In begins at 4:00 p.m. on Sunday (please arrive between 4:00 and 5:00 p.m. Sunday afternoon). Check-Out is at 9:00 a.m. on Friday. Check-In begins at 4:00 p.m. on Sunday (please arrive between 4:00 and 5:00 p.m. Sunday afternoon). Check-Out is at 9:00 a.m. on Saturday. Check-In begins at 4:00 p.m. on Sunday (please arrive between 4:00 and 5:00 p.m. Sunday afternoon). Check-Out is at 7:00 p.m. on Friday. *Any special health needs or medications should be turned in to the Health Supervisor during check-in. **Teen campers who drive to camp must report to and turn in their car keys to the camp leadership team. Non-swimmers are always welcome here, but we do check to make sure campers are safe in the water. Camper swim checks take place Sunday after check-in or Monday at the first waterfront session. The test consists of a short lap swim and a short session of treading water in our swim area under the supervision of our waterfront lifeguards. Please be prepared for this and have swimwear accessible. 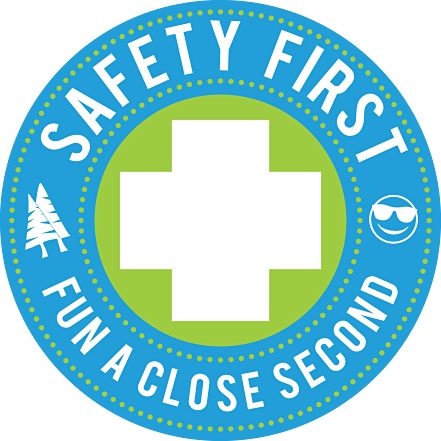 Campers who pass the swim test will have access to all waterfront activities; other campers will enjoy on-shore fun. Can I send mail to my child at camp? Absolutely! Below you’ll find the ways to keep in touch with your camper by snail mail and email. We are 100% conscious of our great responsibility to care for your camper. In the case of an emergency, you will be notified immediately. However, we do not allow personal phone calls or visits during the camp session due to the interruption to the schedule and the effect on camper morale. If a serious concern arises, you may contact the camp director to discuss the situation. If you’d like to send a letter, package or email, click here to find out how. Should my child bring money to camp? We use a “bank” system so campers don’t have to keep track of cash during the week. You may send store deposits with your camp fee payments, call our office at least two weeks before your camp session, or deposit spending money directly into your camper’s store account when you check in on the first day of camp. After camp, any bank balance of $10 or less will be donated to the CRISTA Camps scholarship fund. Any amount over $10 can be picked up in the store when you check out. Refunds will be held for two weeks, after which time they will be donated. Help! My child left an item at camp. What should I do? Please be sure to label all belongings with camper’s name and phone number. If you discover that your camper left something behind, call with a detailed description of the item and the week of camp attended. We will attempt to locate the item and mail it to you promptly. You will be asked to provide the postage required to return the item. All unclaimed items will be donated at the end of the summer. Toiletries (towel, soap, toothbrush, etc. NOTE: High school campers who drive to camp must report to and turn in their car keys to the camp leadership team.